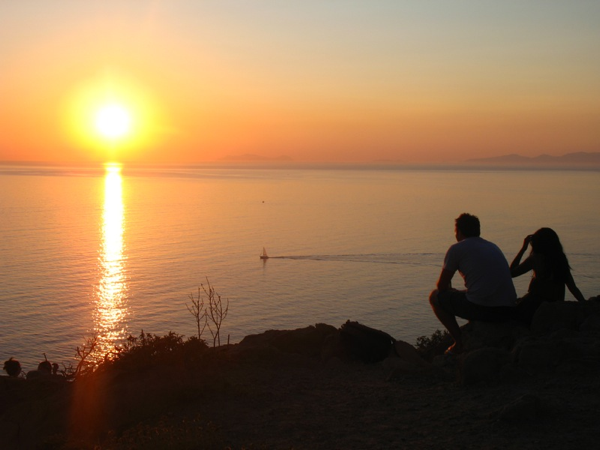 Santorini and sunset are two synonymous words. And this is no coincidence ... Visitors catch their breath with the location of the settlements and the panoramic views from the cliffs. Apart from the world famous Oia sunset, where the sunset is usually applauded, there are less crowded alternatives. On the southwestern cape of the island, the peaceful Akrotiri lighthouse offers a magnificent sunset, while admiring the sea and the sailing boats that complete their day trips. Other beautiful sunset locations are the Monastery of Prophet Elias with sweeping views across the island, the church of Agios Georgios in Imerovigli, also known as the "balcony of Santorini" and the caldera in Megalochori.